aquatherm’s green pipe has proved its technical suitability worldwide for 25 years and is recognised as an optimal solution for that most demanding of applications: potable water systems. The green pipe system offers five different types of pipe – from cold water [ipes to patented fibre-composite, with outside diameter from 16mm to 450mm. In addition, over 450 joining and connection fittings are available. All aquatherm green pipes are WRAS approved and have passed the stringent 40/20 testing requirements which confirms it will not leach contaminants into water like lead, copper and galvanised steel can. 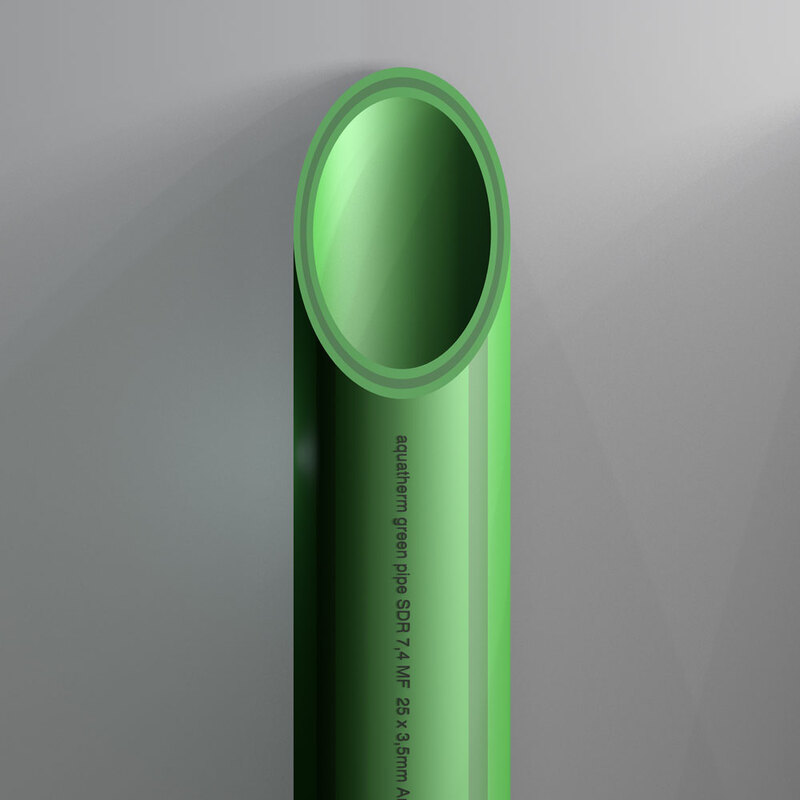 Like all aquatherm pipes, aquatherm green is PVC-free, free from health hazardous heavy metals and is recyclable. 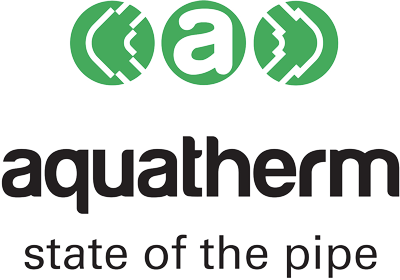 aquatherm is proud to announce the launch of their SDR 9 PP-RP MF pipe, an aquatherm green product for domestic hot water systems. SDR 9 PP-RP MF has a 14 per cent larger internal bore than aquatherm’s standard SDR 7.4 MF pipes, is 16 per cent lighter in weight and has improved pressure ratings of almost 25% in the higher temperature range. The pipe is made from reinforced fusiolen PP-RP material, a PP-RCT classified product and one of the longest lasting and most chemically inert piping materials in the world. This means the pressure rating of the pipe can also be increased. All aquatherm green fittings are compatible with fusiolen-based pipes, so welding work is identical to welding standard pipes and fittings. SDR 9 PP-RP MF will be included in aquatherm’s green/lilac BRANZ appraisal, as well as aquatherm’s Watermark listing. Aquatherm is used in primary industry worldwide, used for general utility services such as cooling water, reverse osmosis/deionised water, compressed air, inert gases, glycol, and others. In addition green is used for food grade requirements in agriculture plant processing. From single family residences to large scale projects, aquatherm’s piping systems can be used for heating and cooling distribution, geothermal applications, condenser water, and many other comfort related systems. PP-R is a corrosion-free, shatter-resistant material, making a great alternative for compressed air systems. A high-impact rating and a wide range of transition fittings make aquatherm piping systems safe and easy to install. Whether it’s light or heavy industry, automotive, manufacturing, aviation, or any other compressed air application, aquatherm’s PP-R provides tangible advantages over traditional pipe systems, including excellent total installed costs and ease of maintenance. Aquatherm PPR has been used for pure water, RO water and deionised systems installations since its introduction 40 years ago, being food grade plastic, inert, non-toxic or leaching with fusion welded connections aquatherm green has been a benchmark product in this sector. Recent use in the breweries, bottled water plants and distilleries has been a growth sector as well in this category. For the next level of performance, aquatherm black system provides a grid based radiant solution that can be used in walls or ceilings. Radiant panels deliver comfortable, energy efficient heating and cooling to the space, while using lower operating temperatures for easy integration with on site energy. The performance of an underfloor heating system is mainly determined by the quality of the installed heating pipe. The aquatherm orange system underfloor heating pipe made of PE-RT is characterised by the following: excellent creep strength even at higher temperatures smooth inner pipe surface low friction loss, high heat stabilized, corrosion resistant, outstanding resistance to chemical, high flexibility, high impact rate, less sound of flow and Importantly oxygen-tight due to EVOH-coating to DIN 4726. Only impeccable water can guarantee public swimming pool operators the reliability they need to provide their guests with consistently good bathing. And only dependable heating ensures them of problem free, energy-efficient operation 52 weeks a year. Aquatherm green is one of the few plastic products that carries an ASTM appraisal for high Chlorine resistance. 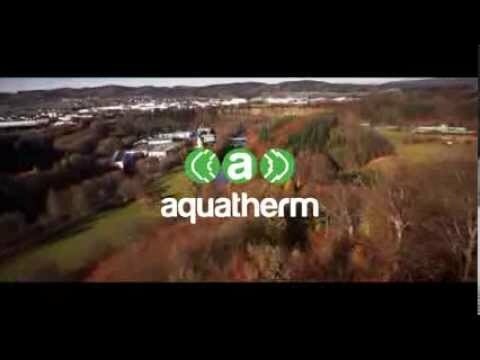 aquatherm green and aquatherm blue pipe systems are delivering comprehensive and reliable functions for both water management and associated heating applications based on over 30 years of experience. From single family residences to large-scale sports floor projects, aquatherm’s piping systems can be used for heating and cooling distribution, geothermal applications, condenser water, and many other comfort-related systems. aquatherm provides a complete system from pipes to manifolds, cabinet’s pumps and essentially design support. In this high-tech day and age, shipping is now faced by an additional major challenge: modern tourism. Today ships are frequently floating palaces, rightly called luxury liners, personal recreation yachts and motor yachts. aquatherm pipe systems are used on some of the largest and loveliest passenger ships all over the world, where their reliability, corrosion resistance, minimum weight and environment compatibility are key elements contributing to safety and maximum comfort in the sanitary amenities, air-conditioning and heating systems on board. Water is a precious resource, and conservation is more important than ever. Our specialized products are a perfect fit for greywater applications. Whether the system is for irrigation, cleaning/laundry, flushing or other related uses, aquatherm lilac is the answer. Since the goal of reclaimed systems is to protect the environment, specifying a long lasting pipe system that’s also one of the world’s most environmentally friendly options just makes sense. Potable water systems are an important part of buildings and our everyday lives. Our systems are designed to be non-leaching, chemically pure, and highly resistant to corrosion. PP-R is an ideal material for potable water because it doesn’t affect the water it carries. The heat fusion connections keep the system free of hazardous chemicals. Green pipe’s distinct colouring blocks sunlight from passing through the pipe wall and promoting biofilm formation, ensuring that drinking water is kept pure from the source to the destination. From single family residences to large scale projects, aquatherm’s piping systems can be used for heating and cooling distribution, geothermal applications, condenser water, in ground district systems and many other comfort related systems. While other materials can corrode and weaken over time, PP-R is always ready when you need it the most. aquatherm red pipe is specially formulated for fire protection systems in concealed light-hazard applications. For multi-purpose systems, aquatherm green pipe can be integrated with the potable water system to provide fire protection. In both systems, the high flow rates allow for mains and branches to be run through the building rather than many individual pipes, keeping the system simple and efficient. External fittings do not restrict flow throughout the system, and fusion outlets allow for a fast, flexible, and reliable installation. Unlike many other plastic materials, polypropylene is completely non-toxic, even under full combustion, eliminating the threat of dangers smoke and fumes. And the heat-fused connections won’t leak or blow apart, protecting the building from water damage and flooding. 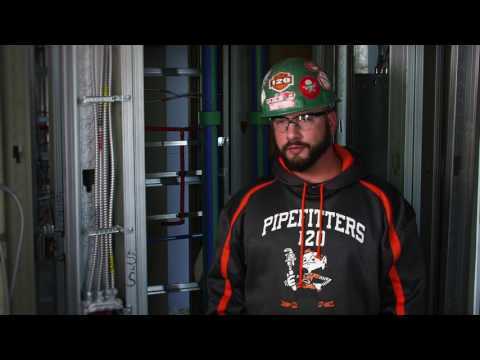 Using aquatherm red pipe makes the systems we all count on to keep us safe even safer. Green can be utilised in accordance with the domestic sprinkler code and combined with the potable water installation. Aquatherm has been used in this sector for both for above and below ground heating applications for over 40 years, heating systems in Europe are an essential requirement for significant periods of the year, aquatherm PPR has reduced scaling, corrosion free application with no oxygen transfer, excellent flow rates and thermal advantages. Its fusion welded connections are leak fee for the entire life time installation. aquatherm is an ideal chilled water pipe system material provider for above and below ground installations. Used internationally for over 40 years aquatherm PPR covers dimensions from 20mm to 600mm for a complete corrosion free application with no oxygen transfer, excellent flow rates, no scaling and thermal advantages for a lifetime installation. Offering excellent chemical resistance and other advantages over other materials, aquatherm pipe systems are ideally suited for a wide range of industrial applications. Industrial facility owners, managers, and engineers worldwide have embraced the benefits of using aquatherm. aquatherm can be used for general utility services such as cooling water, reverse osmosis/deionised water, compressed air, inert gases, glycol, and others. In addition to possessing widespread code approval for many industrial applications, the PP-R pipe system is compatible with a long list of media — it can also be quickly evaluated for approval on a case-by-case basis for special circumstances. For the next level of performance, aquatherm’s black system provides a grid-based radiant solution that can be used in walls or ceilings. Radiant panels deliver comfortable, energy efficient heating and cooling to the space, while using lower operating temperatures for easy integration with on site energy.